Britons Kyle Edmund and Jo Konta reached the final round of French Open qualifying with straight-sets wins. Edmund, the British number four, beat Romania's former quarter-finalist Victor Hanescu 6-1 6-2. British number two Konta saw off Russian seventh seed Elizaveta Kulichkova 7-6 (7-1) 6-3. Brydan Klein lost 6-3 6-1 to Argentina's Facundo Arguello and Naomi Broady went down 6-1 6-1 to Australian Anastasia Rodionova. 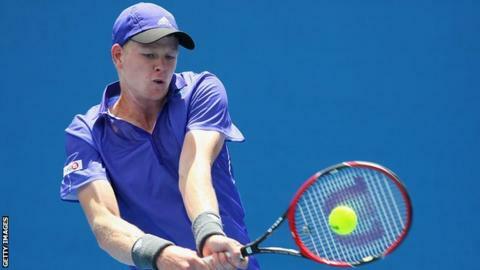 Edmund, 20, outclassed the 33-year-old Hanescu, who lost to Roger Federer in the quarter-finals in Paris 10 years ago. The Yorkshireman broke serve four times as he dominated with his forehand to win in just 67 minutes. "It was really good," said Edmund, ranked 66 places higher than Hanescu at 121 in the world. "I went out there and really respected my opponent. He's been around for a while and made the quarter-finals here, so he obviously can play well here and on clay." Edmund qualified for a Grand Slam for the first time in Australia at the start of the year, and will look to make it two in a row when he faces Spanish 12th seed Adrian Menendez-Maceiras on Friday. "It would be great if I qualify," added Edmund. "I want to be playing in the main draw of Slams, but the way I'm going to get there is by my game improving. "Every day I'm just trying to get better. It's not just about this tournament, it's about where your game's at in six months, in a year. You always want to get better and that's what I'm focusing on." Konta, 24, had a fine win over highly-rated 19-year-old Kulichkova, who is ranked 34 places higher at 110. "I'm really happy to get through that one," said Konta, who missed out in the final round of qualifying last year. "I'm trying not to look too far ahead, I just want to take it point by point, but I'm happy with how I'm hitting the ball, how I'm thinking and how I'm reacting to situations." Konta will play France's Clothilde de Bernardi, the world number 315, for a place in the main draw.